Investigations into alleged breaches of the ministerial code should not be conducted by the prime minister, Tory leader David Cameron has said. The call for independent inquiries is among the ideas being submitted to the Conservatives' Democracy Task Force, headed by former chancellor Ken Clarke. 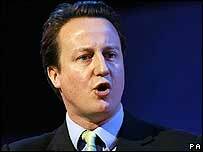 Mr Cameron - who wants to "clean up" British politics - also said MPs should not set their salaries or allowances. The moves are part of an attempt to encourage greater public trust of MPs. In his submissions to the Democracy Task Force, Mr Cameron suggested a "genuinely independent mechanism" should be created to establish whether rules have been broken by ministers. "Tony Blair's government has tarnished politics and eroded public confidence in our traditional institutions," Mr Cameron said. "We need to restore trust and tackle the public's underlying cynicism - that politicians put party before country and partisan spin before the truth. "In short, society has changed. Politicians must change too." Demands for a new system to oversee complaints on the ministerial code followed claims that Culture Secretary Tessa Jowell had broken rules over the business dealings of her now estranged husband David Mills. Mr Cameron has also called for a cut in the number of MPs and ministers. And he wants the task force to put forward ideas for "diluting" the "Punch and Judy aspect" of the weekly Prime Minister's Questions. In the wake of the case, Mr Blair appointed National Audit Office head Sir John Bourn to advise him on the code's operation. His other suggestions include an annual audit of the quality and accuracy of government statistics and an act to entrench the independence of the Civil Service. He expanded on his ideas during a visit to a secondary school in west London, claiming that people felt politicians "feathered their own nests" and cost too much money. "When ministers don't behave properly, we should have an independent system of looking at that, rather than leaving it to the whim of whether a prime minister thinks an abuse has taken place," Mr Cameron said. How green are the blues?